line relative to the dashed line and the very slow rotation of the heavy solid line in inertial space. Also notice that the angular momentum vector is now between the principal axis and the instantaneous rotation axis. If the values of the two moments of inertia /, and I2 are close but not equal, the motion is physically very similar to that shown in Figs. 15-4 through 15-8, but is considerably more involved mathematically. The space cone and body cone have approximately elliptically shaped cross sections rather than circular ones. Thus, «, L, and P are no longer coplanar and the nutation angle, 8, is not constant. Because attitude measurements are made in the spacecraft frame, it is of interest to consider the motion of an object fixed in inertia! space as viewed from a frame of reference fixed on the nutating spacecraft. The motions in this frame of reference are just the reverse of those previously discussed. -Thus, the body cone remains fixed and the space cone rolls around it carrying the inertial coordinate system. 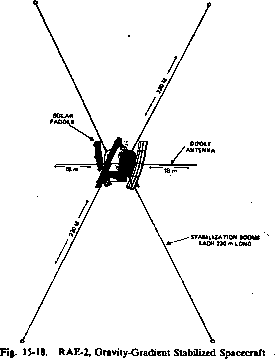 Figure 15-9 illustrates the motion of a point fixed in inertial space as viewed from the spacecraft for the nutation shown in Fig. 15-6. In Fig. 15-9, P3 is fixed at the origin of the coordinate system in each frame and the geometrical point R from Fig. 15-6 is fixed at the position shown by the •. The open square marks the position of L. The solid square marks the position of an arbitrary point, S, fixed in inertial space. (S is shown in Fig. 15-6 as the solid square on the upper axis.) Frames are at the same time intervals in both figures so that the relative orientation of all components is the same for each of the 12 frames in the 2 figures, as is shown most clearly in frame 1. Fig. 15-8. Motion in Inertial Space of a Pointjt, Fixed on a Nutating Spacecraft With /3 > /, = Ir Origin=L, o=P-j, X=u, »=R. Example of Real Satellite Motion. 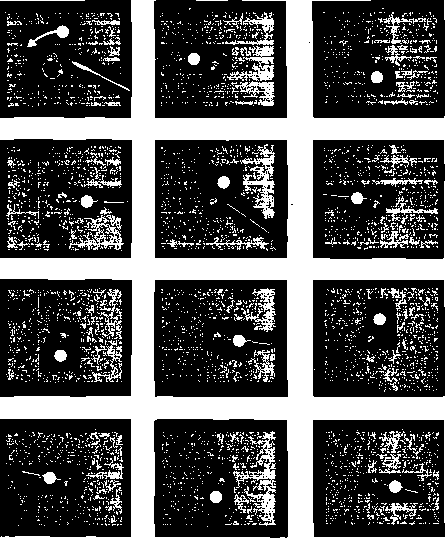 Figure 15-10 shows 12 frames taken at equal time intervals (every 1.25 sec) from a motion picture of an actual, small, scientific spacecraft in orbit. * The spacecraft is the Apollo 15 subsatellite, launched into lunar orbit by a spring mechanism from the service module of the Apollo 15 spacecraft at 21:01 UT, August 4, 1971, just before it left lunar orbit for return to Earth [Anderson, e< 1972). As the subsatellite moved away from the command module, it was photographed by the astronauts using a hand-held camera operated at 12 frames per second. Fig. 15-9. 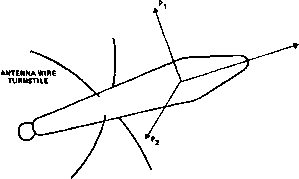 Motion of Point, ■, Fixed in Inertial Space Viewed From a Nutating Spacecraft for Conditions of Fig. 15-6. Origin = P3, X=«, »=R, 0=L. The relative positions of all points are the same as in Fig. 15-6, as seen most easily in frame 1. * Such photographs may become commonplace with shuttle-launched spacecraft Closeup photographs of orbiting satellites prior to that time are rare. Figure 15-10 is taken from the only existing footage at the time of this writing. so that the satellite rotates about 360 deg in 4 frames (90 deg/frame), as can be seen by comparing frames 1, 5, and 9, or frames 4, 8, and 12. By the symmetry of the satellite, we may assume that a principal axis lies along the long axis of the body. Thus, the satellite is nutating, because the principal axis (the body axis) is not fixed in space but is rotating counterclockwise in a small cone whose axis is inclined slightly to the left of center in each frame, as shown by the dashed line in frame 1. 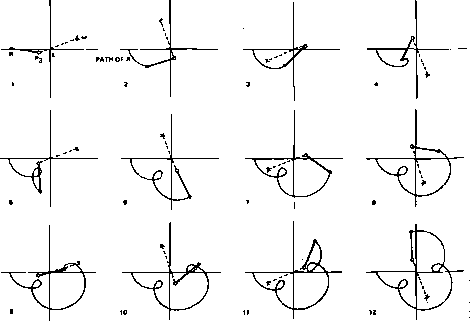 Thus, I3>I| and the motion of the various axes is as illustrated in Fig. 15-5 and 15-8. We shall see in Section 15.2 that this condition determines that the satellite motion is stable, i.e., that the nutation will not increase and will eventually damp out if there are sufficient dissipative forces. Thus, by examining the photographs we see that the three booms are long enough and heavy enough to provide the satellite with stable, rather than unstable, rotation. Although our quantitative estimates may be in error, our qualitative results depend only on the inequality <o,><o, which is clear from Fig. 15-10. / = i where a, and F, are the acceleration of m, and the force applied to it, respectively. The torques, Nf, on the individual points in a rigid body are due to both forces between the points and externally applied forces. Under the very general conditions discussed in Section 16.1, the internal torques sum to zero and the resultant torque, N, is simply the torque due to external forces. The external torques are of two kinds: (1) disturbance torques (described in Section 17.2) caused by environmental effects such as aerodynamic drag and solar radiation pressure, and (2) deliberately applied control torques from devices such as gas jets or magnetic coils. (Control torques due to reaction wheels do not change the total angular momentum of the spacecraft because they are not external torques. A spacecraft with reaction wheels is not a rigid body; the control torques in this case cause a redistribution of the angular momentum between the wheels and the spacecraft body.) Control torques will be discussed in more detail in Section 15.3. If a spacecraft is initially spinning about a principal axis, a torque applied parallel or antiparallel to the angular momentum vector, L, will cause an increase or a decrease in the magnitude of L without affecting its direction. 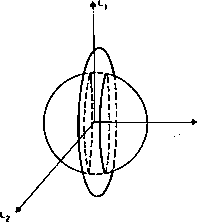 A torque component perpendicular to L, will cause the direction of L to change without altering its magnitude. The change in direction of the angular momentum vector due to an applied torque is called precession. * The special case of slow precession due to a small applied torque (such that the magnitude of the integral of the torque over a spin period is much less than |L|) is known as drift. Environmental torques are a common source of attitude drift. • Note that this definition of precession, which has been adopted in spacecraft dynamics, is somewhat different from the meaning usually assumed in physics. The components of L in inertial space are constant in the absence of torques, but the components of L in spacecraft-fixed coordinates are time dependent. The magnitude, L=|L|, of the angular momentum is constant, however. 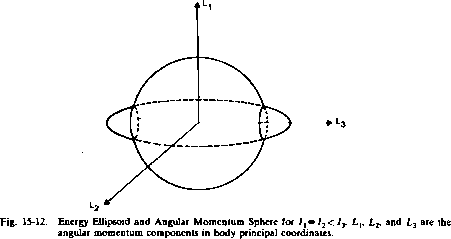 The locus of points in angular momentum space corresponding to a fixed magnitude, L, is just a sphere of radius L, the angular momentum sphere. The locus of possible values of L in the spacecraft frame is the intersection of the angular momentum sphere and the energy ellipsoid. Figure 15-12 shows this intersection for the case /, = /2 < I3, and Fig. 15-13 shows it for 7, = 72>/3. In both cases of axial symmetry, the locus of possible values of the angular momentum consists of two circles about the symmetry axis. 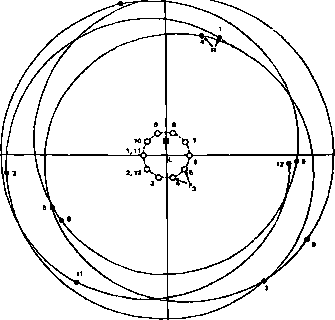 The angular momentum vector in the spacecraft frame moves at a constant rate along one of the circles. This motion is nutation, as described in Section 15.1, Fig. 15-12 corresponds to Fig. 15-5 with P3 held fixed, and Fig. 15-13 corresponds to Fig. 15-4. Fig. 15-13. Energy Ellipsoid and Angular Momentum Sphere for /, = l2> ly- Lt, Lj, and L, are the angular momentum components in body principal coordinates. L\+ Lf=L2, ¿3=6. It will be shown in Chapter 16 that L remains fixed at a point on this circle. Thus, in both examples nutation ceases, and the motion of the body is simple rotation about a fixed axis. Clearly, energy dissipation must also cease (see Section 18.4). Family of Intersections of Energy Ellipsoid and Angular Momentum Sphere for Various Energies, With It:J2:I} in the Ratio 25:5:1. Each curve is labeled with its value of 2/2£/L . Plt Pt and P, are the principal axes; Pl is the major principal axis. reduction rotation axis with the principal axis of largest moment of inertia is known as nutation damping. Several mechanisms for nutation damping are discussed in more detail in Section 18.4. Fig. 15-15. 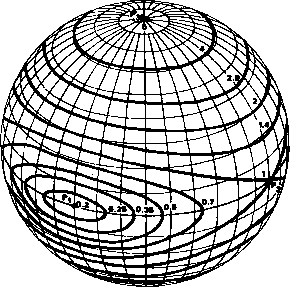 Explorer I. Pj, the nominal spin axis, is the principal axis with minimum moment of inertia. of this excess kinetic energy and the corresponding alignment of the axis of minimum moment of inertia, but the motion rapidly changed into a flat spin mode. Bracewell and Garriott [ 1958] explained this as a result of energy dissipation due to vibrational motions of the antennas. This is an example of the case illustrated in Fig. 15-13. In this case, energy dissipation mechanisms will not reduce nutation, and active nutation damping by means of external control torques must be resorted to. Attitude control is the process of achieving and maintaining an orientation in space. An attitude maneuver is the process of reorienting the spacecraft from one attitude to another. An attitude maneuver in which the initial attitude is unknown when maneuver planning is being undertaken is known as attitude acquisition. Attitude stabilization is the process of maintaining an existing attitude relative to some external reference frame. This reference frame may be either inertially fixed or slowly rotating, as in the case of Earth-oriented satellites. Control System Overview. Control torques, such as those produced by gas jets, are generated intentionally to control the attitude. Disturbance torques are environmental torques (e.g., aerodynamic drag) or unintended internal torques (e.g., crew motion). Because these can never be totally eliminated, some form of attitude control system is required. An attitude control system is both the process and the hardware by which the attitude is controlled. In general, an attitude control system consists of three components: attitude sensors, the control process, and control hardware. An attitude sensor locates known reference targets such as the Sun or the Earth to determine the attitude. The control process or control law determines when control is required, what torques are needed, and how to generate them. The control hardware or actuator is the mechanism that supplies the control torque. Control systems can be classified as either open-loop or closed-loop. An open-loop system is one in which the control process includes human interaction. For example, attitude data from the attitude sensors is analyzed, and a control analyst occasionally sends commands to the spacecraft to activate the control hardware (e.g., fire the jets). A closed-loop, or feedback, system is one in which the control process is entirely electrical or computer controlled. For example, attitude sensors send attitude data to an onboard computer which determines the attitude and then activates the control hardware (e.g., fires the jets). Normally, closed-loop systems are more sophisticated and complex but can maintain a much smaller tolerance on the deviation from the desired attitude. Frequently, in a closed-loop system, the attitude sensors are such that the attitude measurement is directly related to the desired orientation. For example, a wheel-mounted horizon sensor with a magnetic index mark on the body is placed so that the mark should be pointed toward the center of the Earth in azimuth. The difference between the time the index is sensed by the wheel and the time of the midscan between the two Earth horizon crossings is a direct measurement of the difference between the real and the desired attitude. This type of attitude measurement is called an error signal. The function of the control system is to maintain the error signal within specified limits. The example just described is an active attitude control system in which continuous decisionmaking and hardware operation is required. The most common sources of torque for active control systems are gas jets, electromagnets, and reaction wheels. In contrast, passive attitude control makes use of environmental torques to maintain the spacecraft orientation. Gravity-gradient and solar sails are common passive attitude control methods. Attitude control systems are highly mission dependent. 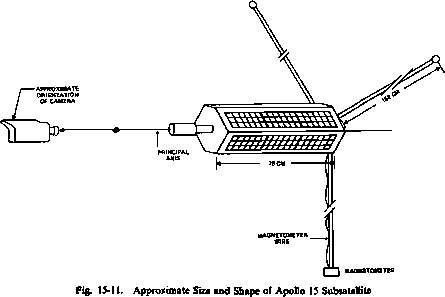 The decision to use a passive or an active control system or a combination of the two depends on mission pointing and stability requirements, interaction of the control system with onboard experiments or equipment, power requirements, weight restrictions, mission orbital characteristics, and the control system's stability and response time. For example, a near-Earth, spin-stabilized spacecraft could use magnetic coils for attitude maneuvers and for periodic adjustment of the spin rate and attitude. Above synchronous altitudes, gas jets would be required for these functions because the Earth's magnetic field is generally too weak at this altitude for effective magnetic maneuvers. Table 15-1 compares the various types of commonly used control methods.